One of the most intelligent and interesting motor sport blogs on the net is The Fastest Lap; apart from anything else, it's written by a Nice Bloke who, like myself, is a Brit living in the States. He covers all of motor sport and only occasionally glances at F1, as is clear from his article on the Hungarian GP; but when he has something to say, he is invariably worth reading. There are two F1 fan's in this office, including me. We always have a nice chat about the weekend's racing on Friday PM and Monday AM. But this Monday EVERYONE joined it. It's clear we all love a bit of handbags here in England. Perhaps I should explain for American readers that "handbags" is an abbreviated way to refer to "handbags (purses, pocket books, whatever) at dawn", stemming from the expression "pistols at dawn" - a cat fight, in other words. This comment really puts into sharp relief something we have known for years but perhaps have never taken into account in all our long discussions about the sport: F1 has an appeal that ranges far beyond its technical and competitive aspects - the political in-fighting that purists so deplore actually extends the reach of the sport to include those who are fascinated by conflict in any form. It is even possible that a large proportion of those who now consider themselves F1 fans were first attracted to the sport by the scandals so often focused upon by the press. We are human and love to watch a good fight. And one cannot blame the press for picking up on those stories that they know will sell their product. There can be no doubt that the constant bickering and scandal that seems so much a part of F1 these days has raised the profile of the sport to the point where most of the general public have some idea of what it is. Whether this is a good or a bad thing depends upon your point of view. Most existing F1 fans give lip service to the idea of greater coverage for the sport but, at the same time, deplore the way it is prostituting itself in the name of "improving the show" - a euphemism for putting more paying customers in seats. The FIA and FOM, however, see their role as maximizing the popularity of the sport (and therefore their profits) and will count increased viewing figures as success. It does not matter to them whether new viewers stay as long as there are always fresh sources of supply to replenish those that are lost. So the scandals actually become a good thing in the eyes of those who control the sport; from their point of view, anything that keeps F1 in the public eye can only do it good in terms of increased numbers of viewers. All publicity is good publicity, indeed. Those of us who have been with the sport for a long time talk constantly about how it is going down the tubes, changing into a beast totally different from its glorious roots, and we offer various prescriptions for curing its disease, most of which entail turning the clock back to the golden age that we knew when we first discovered the sport. We long for the days when competition was hard but fair and contrast such great drivers as Clark, Gilles Villeneuve and Fangio with the spoiled brats of today. Yet is it possible to return to the past? How do we un-invent the science of aerodynamics, how can we exclude the influence of high finance in the fortunes of the teams, how simplify rules that have been made to prevent cheating amongst players who compete for such high stakes? Maybe we are all dinosaurs and the sport cannot do other than develop and change into a creature more fitted for the brave new world of tomorrow. As one of the dinosaurs, I have to hope that there remains a way to return to an earlier age, that we might yet devise some solution to this wild career into a future so uncertain and so different from everything we have known before. But, at the same time, my eyes are open and I have to admit that it may not be possible to get back what we have lost, that F1 must ready itself for the new world and become something entirely new. All I can do is hang on grimly and watch, hoping that, whatever happens, the actual racing will still be worth watching. 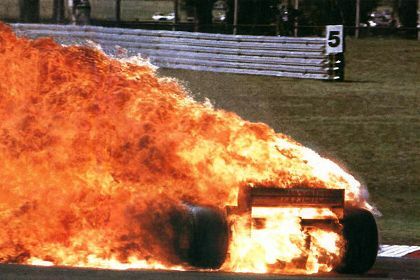 Hey Clive ......is that photo of the car on fire meant to be great "publicity"? I'm sorry that photo and a tie to publicity went over my head but on the subject spectacular incidents did any one see the Dario Franchitti crash in champ cars last weekend. It was far worse than Kucica's crash at Montreal. The car went airborne, landed up side down right on his head and then was shoveled up by another racer and tossed in the air a second time. It looked pretty grim, and when the workers overturned the car by hand...... he waved to them and stepped out. That's one luck man! I did see a video of Dario's crash and it was indeed horrific. He was in the upside down car for what seemed ages and then, when they turned it the right way up, he just climbed out as though nothing had happened! It's incredible the punishment modern cars can sustain and still protect the driver. The Dario crash happened in Indy car, Champ car is an actual race series with turns going in both directions. There is a lot of talk now that the high speed tracks will no longer be used in Indy car due to incidents like that. He was lucky not to lose his head when he was up side down and was struck again by the nose of an on coming car. As for the blog, maybe its that I am young and indifferent to the 50 year history of the sport, but if a split were to happen like was talked about in past years I would follow the sport with the best racing (ala Champ Car/Indy Car). I think the only way we will ever get what we want is if there is a competing series that does the same thing better. It wouldn't have the history of F1, but this current Formula has changed so much over the years its hard to make the connection with what we currently watch and what we used to watch. I'm always up for a good stirring of the pot. Thanks for the clarification, Dan. I find it easy to get confused as to who drives in which American open wheel series but am beginning to get a handle on it now. Bourdais is in Champ Cars, right? But the Indycar/Champ Car split is what terrifies F1 now. We have seen how neither series has managed to attract the support that the old CART enjoyed and fear that F1 would fare the same if it split into two. We may talk about an alternative F1 but I think it would take a huge crisis to bring it about. Bernie is an older man, and I'm sure has a hard time grasping the technology computers offer us (I could be completely wrong on that of course). Do you think he pays attention to the more popular blogs and discussions? or at the very least has someone scan through them for him? I mean the best way to 'Improve the show' is to listen to your consumer. I am sure that Bernie would claim to know all about the information technology revolution, Dan, but his actions show that to be less than the truth. Recently there has been considerable fuss over FOM's ruthless deletion of F1 videos from YouTube and this shows a complete lack of understanding on their part of how to deal with the new technology. Other industries have realized the enormous marketing potential of developments like YouTube and are exploiting them very effectively. Not so when it comes to the money-grubbing FOM and Bernie. I was just thinking yesterday about the future of F1, after listening to a podcast of Midweek Motorsport from last month in which the 2011 tech regs were being discussed. Major factors are going to force F1 to change in the next few years. Climate change is going to precipitate rule changes in regards to the kind of fuel used (and how much, with recovery of energy technology that will reduce the consumption). I think moving to a small-capacity, unlimited boost-turbo engine, with a 50% downforce reduction will once again make the cars hard to drive and perhaps return us to the kind of hair-brained excitement of the past. That wouldn't have been the Renault team podcast, by any chance, Neil? I listened to it too and was impressed with Pat Symonds' careful and reasoned statements on the matter. As to whether all the changes will make things better, I have my doubts; hopefully, the manufacturers will curb Max's wilder dreams. "As for the mass media revolution, I'm an old guy myself so I know what a struggle it is to keep up"
Clive, you can be forgiven for having trouble keeping up with the mass-media thing. Occasionally, I have trouble, and part of my (recently-completed) degree was on stuff like this... Sometimes society just runs into itself! Bernie is making all the same mistakes as the music industry did. Eventually he'll have to do the same as the music industry and have cheap, full-quality content on-line without restrictions. Unfortunately, it is likely to take a few years to drag that out of him. Remember he still thinks that charging £340 for a mousemat is a good idea (it hasn't been since the days when they were still called X-Y Directional Pointing Devices). I think that may be what annoys me most, Alianora - that Bernie obviously hasn't learned a thing from the experiences of industries that went through all this before he came along. No doubt he's been so wrapped up in F1 that he hasn't had time to look outside it. And that kinda answers Dan's question too, doesn't it...?